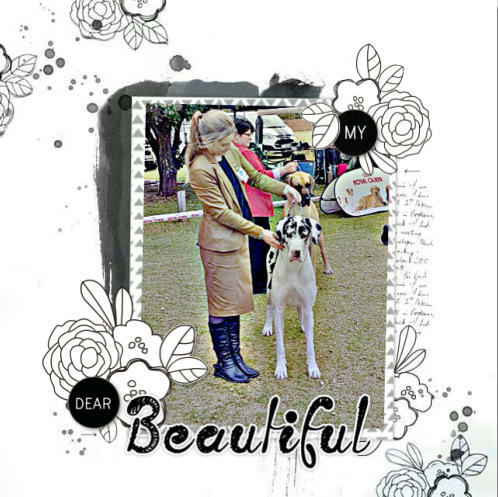 • Sire : Mervyndane Oxfordshire of Gavelle A2/A2 ED00 • Dam: Saxony In Short Supply B1/B1 ED00 In nearly 20 years of owning Great Danes I have never had my heart so stolen... Joanie was my keeper pup from the very start and when she was diagnosed with a congenital heart defect at 2.5 weeks I was devastated. The prognosis was poor and many gave the opinion that no heroics should be attempted and that she should be euthanased. But Joanie (also known as Bones) had a real fighting spirit and I decided to do everything I could to save this special girl. After weeks of surgery preparation she underwent the operation at the tender age of 7 weeks. She sailed through and was back home in a few days. 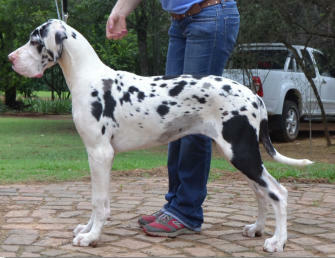 A very tiring period of some months followed, but Joanie is thriving and has grown into a very elegant young lady. She is a happy, naughty, affectionate, delightful (and did we say naughty) puppy. What this puppy has been through in her life so far has been remarkable and she is very aptly name - our tiny warrior princess (with a dash of madness), Saxony Joan D Arc. Joanie has been shown a few times, gaining a RBPISS and a CACIB. She is the resident Senior Dog in McKaynine Training Centre puppy classes and shows the most superb temperament with pups and their owners. She also enjoys K9 Yoga! Joanie recently passed her therapy dog evaluation and we are looking forward to our probationary visits in the next couple of months.